Alright, I know I keep stumbling across sites that allow you to manage your training logs. There are quite a few out there and more arriving all the time. Today, I learned of yet another site (thanks Paul), +3 Network, that works quite well at logging your training. The twist with this site is that your activities are converted into charitable donations. That’s right! 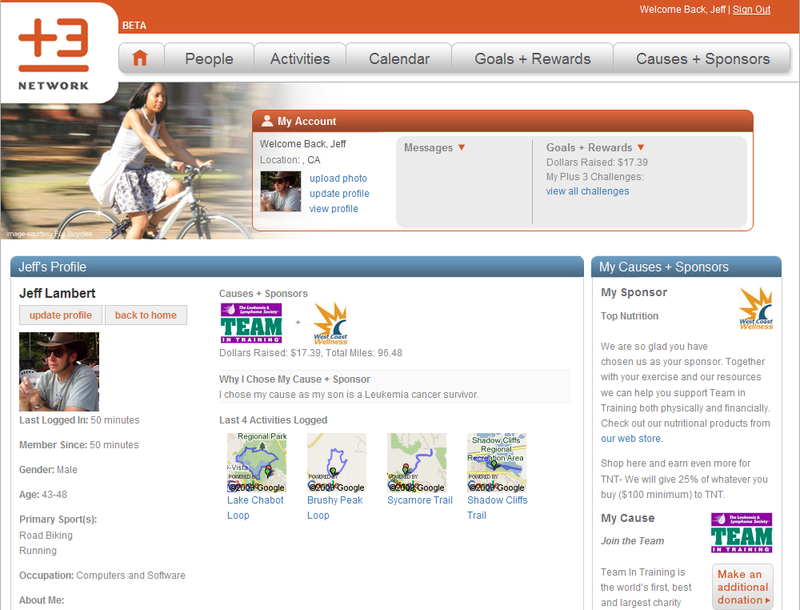 The way it works is you select a Cause and a Sponsor pairing when you sign up. Then, when you go for a run, or a bike ride, or a hike… your mileage is converted to a monetary value that the Sponsor then donates to the matching Cause. 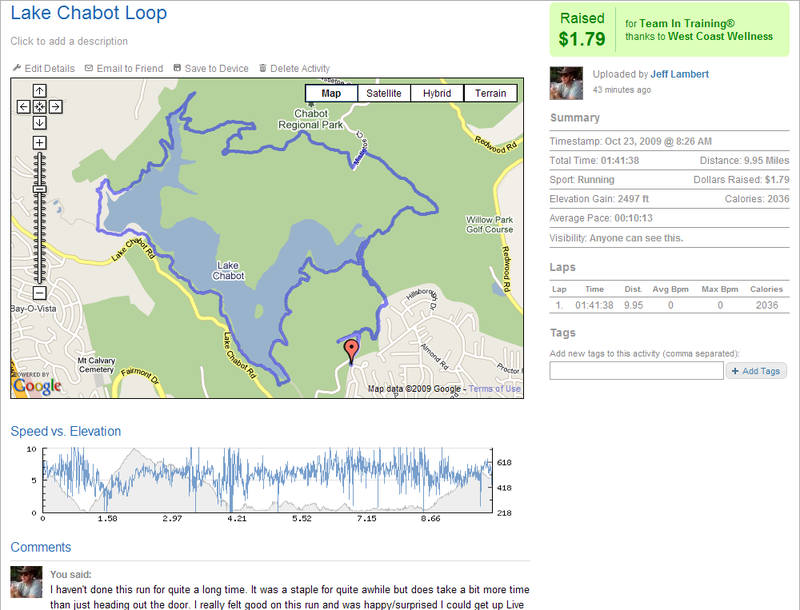 I signed up for the Leukemia Team-in-Training Cause and uploaded tracks from my Garmin Edge 305. This was easy. 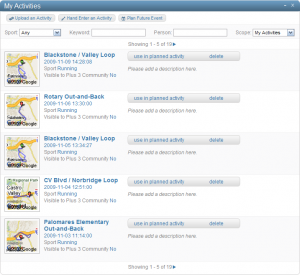 I was then able to process 19 of the 108 activities that uploaded, noting what type of activity I performed and also give it a name, description and tag it. I wasn’t able to add more than 19 after my initial sync, and a subsequent sync appeared to be loading the remaining activities but those I could add when the sync finished were the same set I already had added. Could be that the limit is the last 20 or so runs. Seems reasonable to me. The feature set on this site is not very extensive but what they do have has been well implemented. The user profile could be extended a bit to allow specifying your FaceBook, Twitter, blog, LinkedIn or other socially networks. 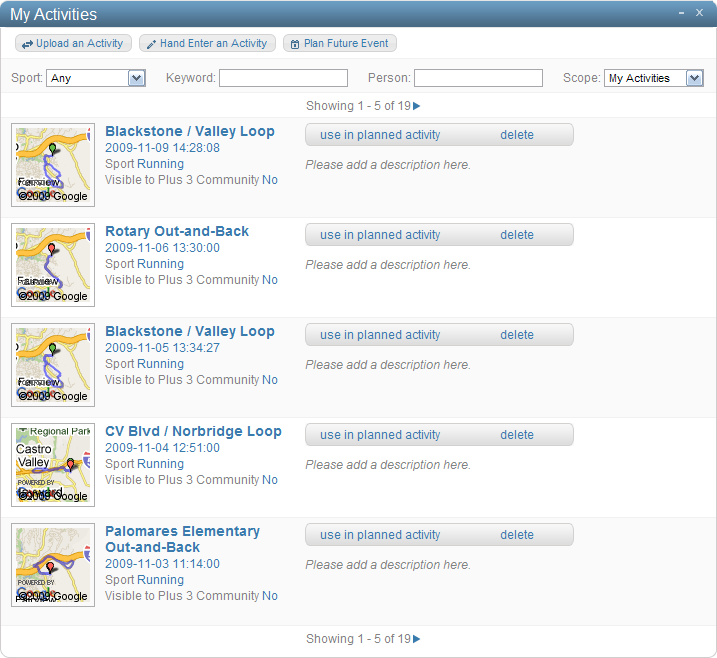 The activity listing also is a bit lacking in navigating from page-to-page. One thing you will note, is that the word “beta” appears in the header, so, one can only assume that more is yet to come. There also is a forum where you can leave suggestions, amongst other topic comments. The best feature is that one can spend a few minutes recording an activity that will result in a donation going to a worthy cause. The result of my logging the 19 activities was the donation of $17.39 to the Leukemia Team-in-Training cause. 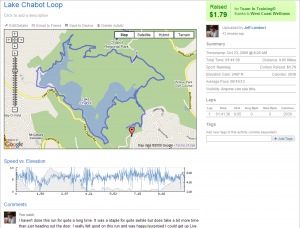 Happy running (biking, swimming, walking…)!